LAS VEGAS – TruSpeed Autosports’ Kevin Woods and Competition Motorsports’ Sean McAlister each took overall victories from pole in the split group Race Two of the Pirelli Trophy West USA series on the road course at Las Vegas Motor Speedway on Sunday as the series launched the 12th season of competition for the growing championship. 33 cars in six Porsche classes contested the first two races of the season: Diamond and Diamond Masters (2017-2018 991.2 GT3 Cup), Platinum (2015-16 991.1 GT3 Cup), Gold (2010-2013 997.2 GT3 Cup), Silver (Cayman Clubsport GT4 MR) and Bronze (2016 Cayman Clubsport GT4 Trophy) classes. To generate the best races for the stand-alone event, series organizers chose to make the race split by generation, rather than iteration. For this event only, the Diamond Classes raced together, with Platinum, Gold, Silver and Bronze competing in a separate race. 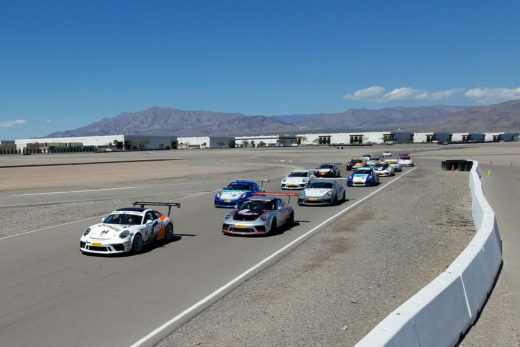 At subsequent events, classes will be split by 911 GT3 Cup Cars and Cayman Clubsport GT4 cars. 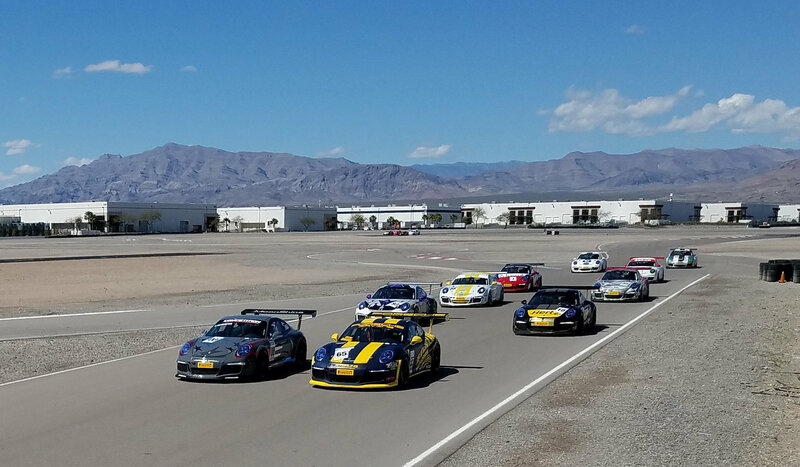 Both groups enjoyed 20-lap, 40-minute flag to flag races under bright, sunny skies that saw hard, clean, caution-free action. In Group 1, former series Champion Woods took his No. 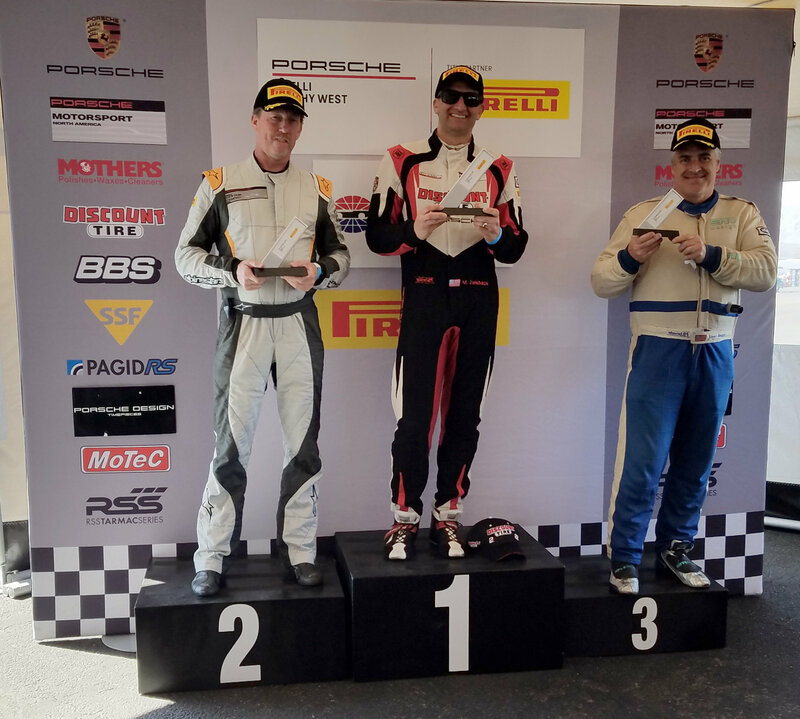 94 Mothers Polish/TruSpeed Autosport 991.2 GT3 Cup Car to a 12-second advantage over 2017 series Champion Loren Beggs and David Donner. Woods needed every second of that advantage, as a mechanical problem stalled the car coming to the checkered flag, with Woods hanging on for a two-second win. Beggs spent much of the first half of the race in a hard fight with Michael Zuieback, who started second in the No. 2 Competition Motorsports machine. 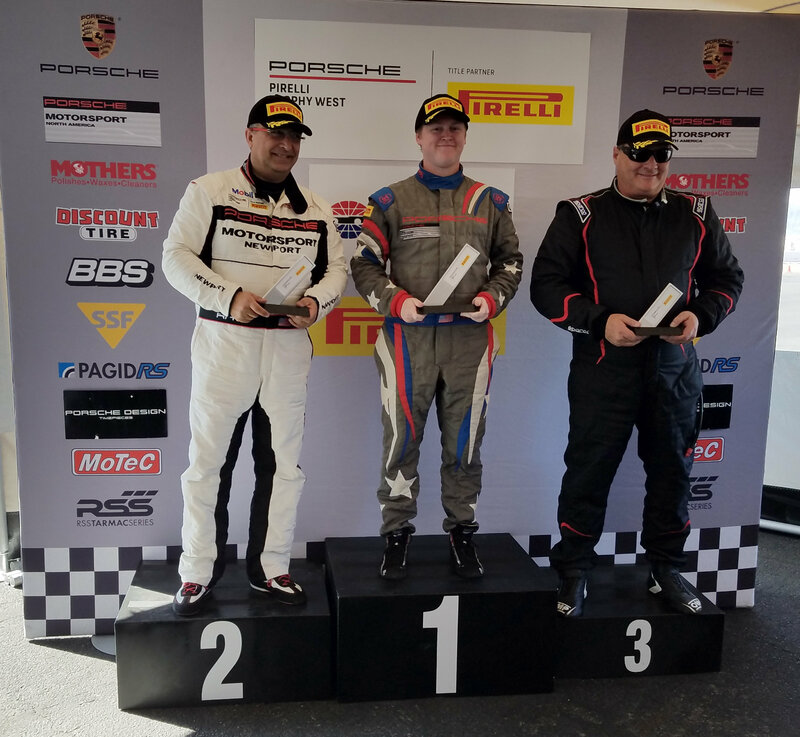 Beggs made the inside move in Turn 1 and took the second overall position on Lap 14 as Saturday race winner Zuieback finished third overall and earned the Diamond Masters class victory ahead of teammate Mike McAlister. In the Group 2 race, Sean McAlister started his No. 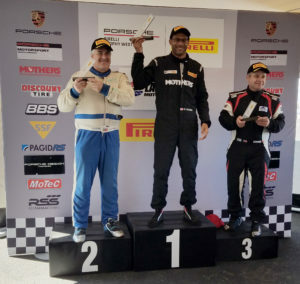 00 Competition Motorsports 991.1 GT3 Cup Car from overall and Platinum class pole and parlayed that into an insurmountable lead over 2017 class champion Ray Shahi, with traffic being the only concern for the 21-year-old Californian. McAlister took the double victory in his first weekend in the Platinum class. 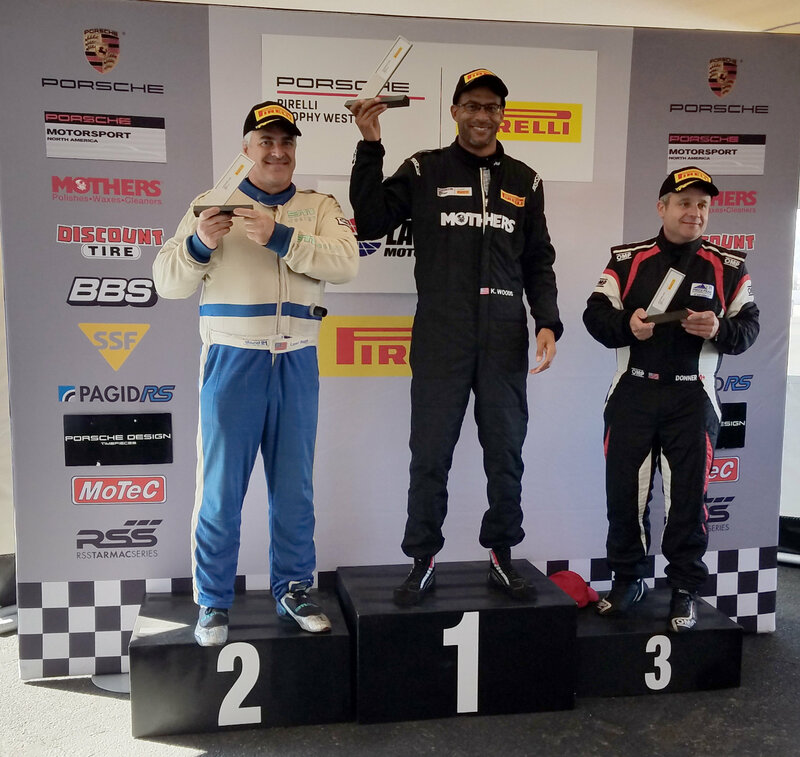 Leon Desimone took his second Gold Class win of the weekend with a solid drive in the No. 7 997.2 GT3 Cup Car. The Racer’s Group teammates Chris Bellomo and Jim Rappaport enjoyed a spirited battle early in the race until a spin by Rappaport in Turn 4 gave clear sailing to Bellomo, driving the No. 67 TRG Cayman Clubsport GT4 MR.
Carl Tofflemire and Laura Ely picked up right where they left off in Race One, working their way past several Platinum Class cars to renew their Bronze Class nose-to-tail battle in clean air. Ely made the move around Tofflemire on Lap 16, putting her No. 09 Cayman Clubsport GT4 Trophy machine into the class lead, and held off the South Bay Porsche driver to the finish. Competent Motorsport president Greg Franz was understandably thrilled with the season opener. 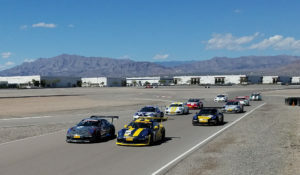 The Pirelli Trophy West USA heads to the Thermal Club near Palm Springs, Calif. in two weeks time, April 6 – 8. This entry was posted in News on March 25, 2018 by admin.